There are so many beautiful gardens and historic houses to see within a couple of hours drive of London. Here are just a few ideas for some of the most glorious day tours. Most of the trips below would be governed by individual opening hours and the days on which properties can be visited. Please contact me to check opening times. Prices are per tour, NOT per person, and do not include entrance fees, which would be payable on the day. Great Dixter and Sissinghurst are two of the most famous 20th century English gardens, created respectively by gardening writer Christopher Lloyd and writer Vita Sackville West and her husband Harold Nicolson. Knole was the much-loved childhood home of the writer Vita Sackville-West, an extraordinary complex of ancient buildings with very fine 18th century state rooms, and an art collection with works by Van Dyck, Gainsborough & Reynolds. It is surrounded by parkland, and some of the least-timorous deer I have ever encountered. You won’t be able to see all three in a day! If you love gardens, visit Sissinghurst & Great Dixter. If you’re interested in Vita Sackville West, then visit Knole and Sissinghurst. Or you may even prefer to just linger in one. Prices are per tour, not per person, with a maximum of 6 people. 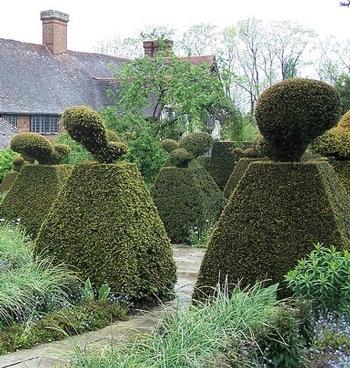 Hidcote Manor (pictured above) is among the most famous 20th century gardens in England. It’s designer, Lawrence Johnston, created ‘garden rooms’, each with its own character and peak season. 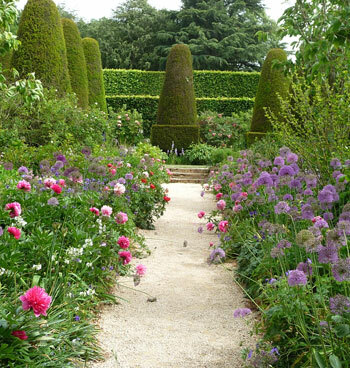 The balance between control and abundance, between line and colour, is achieved to perfection at Hidcote. Hidcote’s neighbouring garden, Kiftsgate Court, is the work of three generations of the same family, who collected plants from all over the world. Created on the Cotswold escarpment, it enjoys spectacular vistas towards the Vale of Evesham. 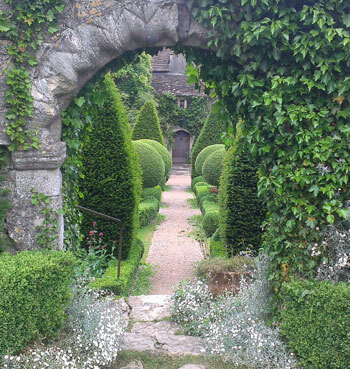 Landscape architect Harold Peto created a unique and romantic hillside garden at his home Iford Manor, influenced by his love for Italian gardens, and decorated with his collection of architectural treasures. 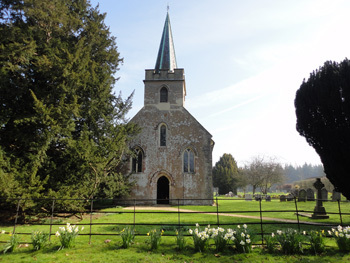 Abbey House Gardens, also on a hillside, is set against the backdrop of Malmesbury Abbey. It has a huge collection of plants for all seasons, including over 2000 different roses. There should also be time to look into Malmesbury Abbey, a beautiful 12th century church, once home to historian William of Malmesbury and Eilmer the Flying Monk. 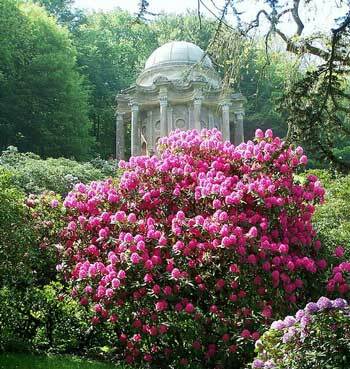 An 18th century garden with a picturesque lake, classical temples (you might recognise one from the Keira Knightley film ‘Pride and Prejudice’), grottos and exotic trees – in fact the finest example of the English Landscape Garden, and an interesting Palladian mansion. There’s a good pub for lunch, too. Arundel Castle, the home of the Duke of Norfolk, is one of the great houses of England. 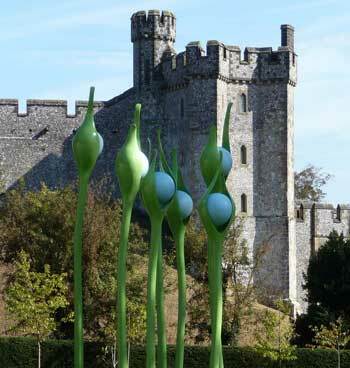 Its “Collector Earl’s Garden” is by quirky designers Isabel and Julian Bannerman, and honours the 17th Earl who built up an unrivalled art collection. Brighton and Chichester are coastal towns, famous for their architecture, galleries and quaint streets. Petworth House is, like Arundel Castle, a historic house famous for its art collection and landscaped gardens, which were immortalised by the artist JMW Turner. Chawton was the home where Jane Austen revised Sense and Sensibility, Pride and Prejudice, and Northanger Abbey for publication, and wrote her final three novels. En route we will stop in Steventon, the village where Jane spent the first 25 years of her life, to visit the church where her father, and then her younger brother, were rectors. We could also go to Winchester to see where she spent her final days, and where she is buried in the cathedral. 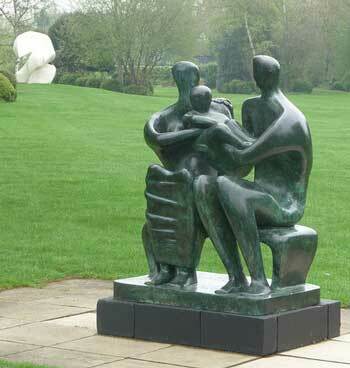 Visit Hoglands, Henry Moore’s home at Perry Green, as well as his studios, sculpture garden and changing exhibitions. Also see a stained glass window by Henry Moore in a local church. Complete the day by visiting the very unique sculpture garden of Sir Frederick Gibberd, architect of Liverpool’s RC cathedral, and of the older terminals at Heathrow Airport. Explore the Essex & Suffolk landscapes, villages and churches painted by 19th century artist John Constable. 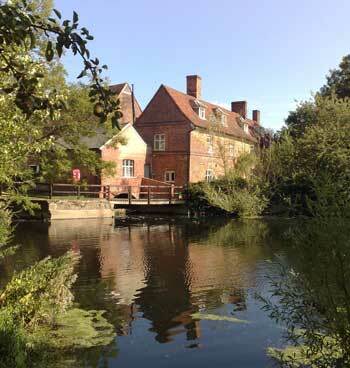 Take a guided walk along the banks of the River Stour, where he painted his best-known works – see Flatford Mill, Bridge Cottage, Willy Lott’s Cottage and views over Dedham Vale. Although he lived in the 19th century, designer William Morris’s fabrics and wallpapers are still popular today. 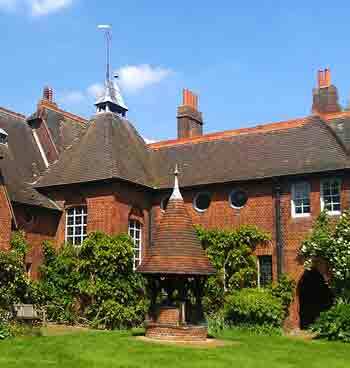 He worked with architect Philip Webb to create his own family home, the Red House, which still contains some of the furniture and stained glass designed by his Pre-Raphaelite artist friends Burne-Jones and Rossetti. Standen, by the same architect, designers and artists, is ‘a showpiece of the Arts & Crafts Movement’. 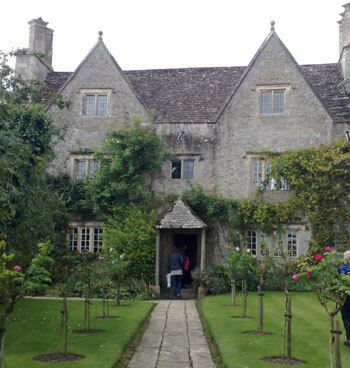 Kelmscott Manor was the country home of the designer William Morris and his family. A 16th century Cotswolds farmhouse, for Morris it was ‘a heaven on earth’. It contains a collection of works by Morris and his friends, including paintings, furniture, textiles, carpets and ceramics. Buscot Park is home to Lord Faringdon, and to the Faringdon Collection, which includes works by Rembrandt, Reynolds, Rubens, van Dyck, as well as the Pre-Raphaelites Rossetti and Burne-Jones, and contemporary artists. In the grounds, the beautiful Water Garden was designed by Harold Peto, and the Four Seasons Walled Garden by the present Lord Faringdon. Charleston Farmhouse was the home of Vanessa Bell & Duncan Grant, and country meeting place for the writers, painters and intellectuals known as the Bloomsbury Group. Monk’s House was the country retreat of Vanessa’s sister, the writer Virginia Woolf, who also briefly lived in nearby Lewes. 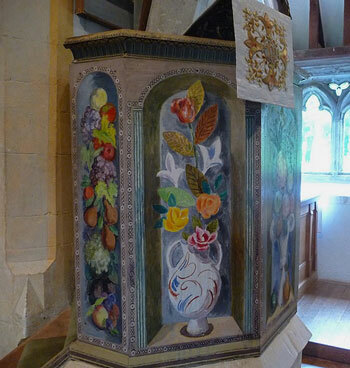 Berwick church has decorative paintings by Vanessa Bell and Duncan Grant. Farley Farmhouse was the home of Surrealist painter Roland Penrose and photographer Lee Miller. The house is open on Sundays between April and October, sometimes twice a month, and sometimes every Sunday. There are occasional Saturday tours led by Lee Miller and Roland Penrose’s son and grand-daughter, but these sell out very quickly. Because of the constraints of its opening arrangements, this tour needs to be individually planned. The Red House in Aldeburgh, the home of Benjamin Britten & Peter Pears from 1957, is where much of Britten’s music was composed. 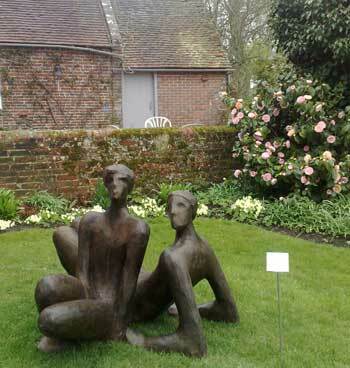 The house today is very much as Britten and Pears left it, full of the art they collected together. Aldeburgh itself is a very picturesque seaside town. 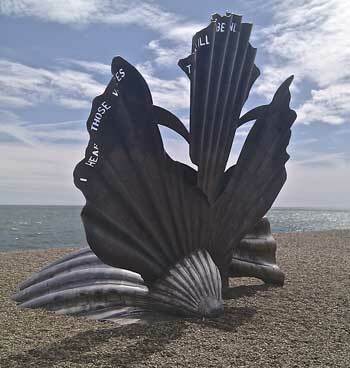 The church has a window by John Piper commemorating Benjamin Britten, and a more recent memorial on the beach, a beautiful sculpture called The Scallop by Maggie Hambling.